I would like to focus your attention on the engine that started it all; the Ford V8, a.k.a. the flathead. October 11, 2009 was the annual Throttlers Car Club car show at Johnny Carson Park in Burbank. It’s the best local show and that attracts the best in traditional hot rodding from surrounding neighborhoods. A smallish show… under two hundred cars. But what it lacks in size it makes up in nostalgia. Above, two great looking V8s from members of the Burbank Choppers car club. A lot of effort has to be spent keeping polished aluminum engine parts bright. This one is in Vern Hammond’s ’34 chopped coupe, also a member of the Choppers. His car has got to be one of the more famous of the traditional cars of today. The 4x2 Sharp brand intake means business. And those Evans heads were one of the better performing heads of the day. Here’s a pre ’39 V8-60, 21-stud engine with a Thickstun intake. It was in front of a 26/27 Model T roadster body on a 1932 frame, with a chopped ‘28/29 Model A grill. A daring combination, and worth some attention. He’s got all the right parts for a correct vintage rod. This looks like a ’49-53 8BA engine with 59A type cylinder heads. I like the Mallory distributor. This was in a channeled ’28 A-bone with a truck grill. It would look better with an old radiator cap and vintage looking ignition wires. Here is a great looking 21-stud engine with polished stock heads, likely a 1937 or ’38. Evans triple intake manifold, Stromberg 97s, and a Spalding magneto. I don’t mean to be picky, but the radiator overflow is totally out of place. The engine on the left has a Edmunds intake with stands that elevate the Holley 94 carbs, and Eddie Meyer heads. The engine on the right has Edmunds heads combined with the Edmunds intake with 97 carbs, as wells as a Fil-Cool-Ator oil filter unit on the firewall. Opinions In Rodding: Vintage or Nostalgic? A lot of people might think those two adjectives may mean the same thing when it comes to hot rodding. But in fact they couldn’t be more different. A “vintage” hot rod may be a rod built a long time ago or a car built today with vintage parts. Any car that has raced on the dry lakes of southern California in the 30’s-60’s for example, a nd has survived through today, is certainly a vintage hot rod. 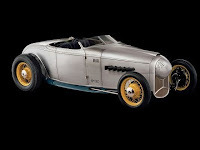 The Doane Spencer ’32 roadster may be the most famous of those cars these days. While a nostalgic hot rod on the other hand, is a car constructed more recently and looks like it was built in another place it time. A good example might be Jimmy Shine’s ’34 Ford pick-up with it’s Ford flathead V8, a red painted steel wheels. I call my ’29 a ‘nostalgic hot rod’, and like to say it looks like an early 50’s street roadster. There a lot of guys I’ve met recently who are building era-specific cars. The popularity among younger car builders is growing do in part to the focused coverage by popular rodding magazines like Rod & Custom, Street Rodder, and newer periodicals like Hot Rod Deluxe. The latter only covers cars & shows that are predominantly 1940-60’s nostalgic & vintage hot rods & customs. The father of all rodding mags, Hot Rod Magazine, covers hot rodding maybe too broadly, and includes the entire spectrum of domestic car performance building. Which is exactly what they were doing when the magazine started in 1947, so I have to give them credit for staying focused. But what was new then, is nostalgic now. A lot has changed since 1947, souping cars today is mainstream America in every sense of the term. And so may be building an ol’scool hot rod soon. Although the number is still very small, building pre-1940’s cars into vintage street machine seems to be on the rise. And fervent to avoid the rat rod stigma, guys are taking more ef fort to add old parts in a manner to make them look purposeful and with respect to way it was done in the past. There are some who like to take nostalgic to new heights with themes never on vintage cars like aviation focused cars, referring to WWII fighter planes. I won’t argue, they don’t hearken to times past, but they tend to be too showy and unrealistic. “Rat Rods”, the scorn of in the hot rodding community, is the modern day term that defines a barely drivable, unfinished, rough & rusty car. Often built by individuals with little or no sense of rodding history, having only basic mechanical knowledge, and light on funds to do the job right. Typically using a junkyard 1970’s or newer engine, and often having 1920 to 30’s sheet metal hanging off a homemade frame, the car will have a minimal interior. 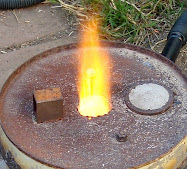 More time is spent placing adornments such as skulls, flames, or lightening holes then replacing leaking gaskets or completing a weld bead. Air-bad suspensions, crudely chopped tops, and misuse of modern car parts is a tale-tell sign you are looking at a rat rod. But “rats” are only one facet on the automotive cultural gem, and there are many. Tomorrow builders will do things differently… or maybe not. For what has been before, will be again. And as long as there are open plains with American iron in them waiting for the day they can be resurrected again --there will be someone with a pick-up truck and a run-away imagination willing to take the challenge.